In science, self-satisfaction is death. 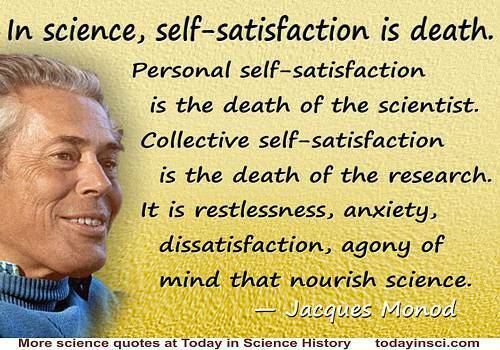 Personal self-satisfaction is the death of the scientist. Collective self-satisfaction is the death of the research. It is restlessness, anxiety, dissatisfaction, agony of mind that nourish science. Quoted in 'Ariadne', New Scientist (17 Jun 1976) 70, 680, which states it comes from Le Nouvel Observateur which revived the quote, “from an earlier interview.” If you know this primary source, please contact Webmaster. Science is a method of logical analysis of nature’s operations. It has lessened human anxiety about the cosmos by demonstrating the materiality of nature’s forces, and their frequent predictability.